Austrian litterateur and philosopher; born in Budapest July 29, 1849.His parents were very poor. His father, Gabriel Südfeld, had been a rabbi in Prussia, but went to Budapest as a private teacher. Max received his elementary education, including that in Latin, Greek, and Hebrew, from his father in his native city, and attended the university there. He devoted himself to the study of medicine, but pursued in addition literary-historical studies, which had a great influence on his future career. While yet a student, as early as 1863, Nordau began his literary activity; and in that year some of his poems, essays, and tales were published. 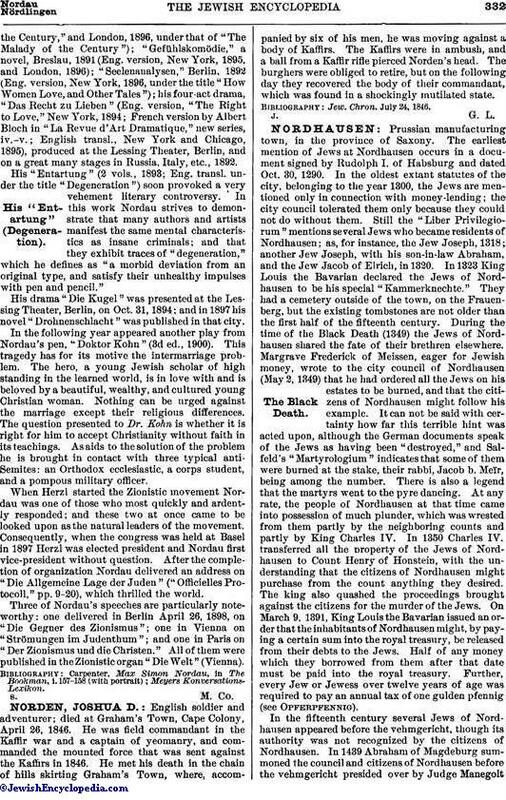 In 1865 Nordau was the principal contributor to a paper called "Der Zwischenact," with which he remained associated until he entered the university. He then became a regular contributor to the columns of the "Pester Lloyd," and for six years was connected with that journal in an editorial capacity. In 1873 he had completed his course, received his degree of M.D., and passed his state examinations. He then went to Vienna to discharge his conscription duties as military surgeon, and spent about six years in travels, visiting Berlin, Russia, Scandinavia, England, Iceland, France, Spain, and Italy. In 1878 he returned to Budapest, where he practised medicine, and in 1880 he settled permanently as a physician in Paris. 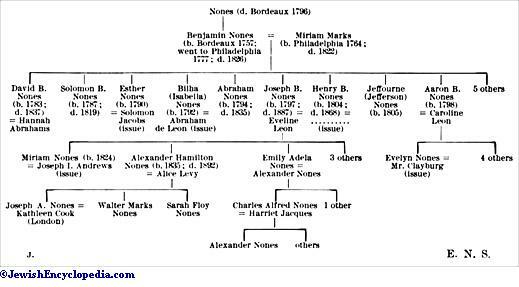 Pedigree of the Nones Family. Literature still attracted Nordau and absorbed much of his time and attention. 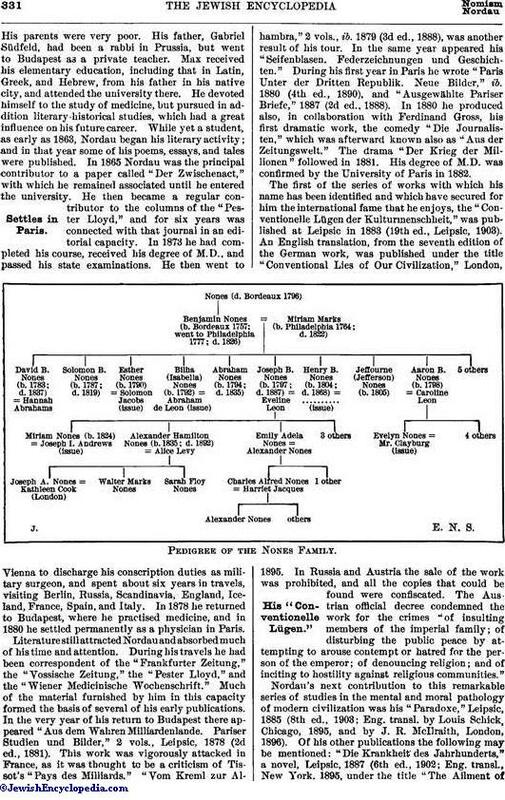 During his travels he had been correspondent of the "Frankfurter Zeitung," the "Vossische Zeitung," the "Pester Lloyd," and the "Wiener Medicinische Wochenschrift." Much of the material furnished by him in this capacity formed the basis of several of his early publications. In the very year of his return to Budapest there appeared "Aus dem Wahren Milliardenlande. Pariser Studien und Bilder," 2 vols., Leipsic, 1878 (2d ed., 1881). This work was vigorously attacked in France, as it was thought to be a criticism of Tissot's "Pays des Milliards." "Vom Kreml zur Alhambra," 2 vols., ib. 1879 (3d ed., 1888), was another result of his tour. In the same year appeared his "Seifenblasen. Federzeichnungen und Geschichten." During his first year in Paris he wrote "Paris Unter der Dritten Republik. Neue Bilder," ib. 1880 (4th ed., 1890), and "Ausgewählte Pariser Briefe," 1887 (2d ed., 1888). In 1880 he produced also, in collaboration with Ferdinand Gross, his first dramatic work, the comedy "Die Journalisten," which was afterward known also as "Aus der Zeitungswelt." The drama "Der Krieg der Millionen" followed in 1881. His degree of M.D. was confirmed by the University of Paris in 1882. The first of the series of works with which his name has been identified and which have secured for him the international fame that he enjoys, the "Conventionelle Lügen der Kulturmenschheit," was published at Leipsic in 1883 (19th ed., Leipsic, 1903). An English translation, from the seventh edition of the German work, was published under the title "Conventional Lies of Our Civilization," London, 1895. In Russia and Austria the sale of the work was prohibited, and all the copies that could be found were confiscated. 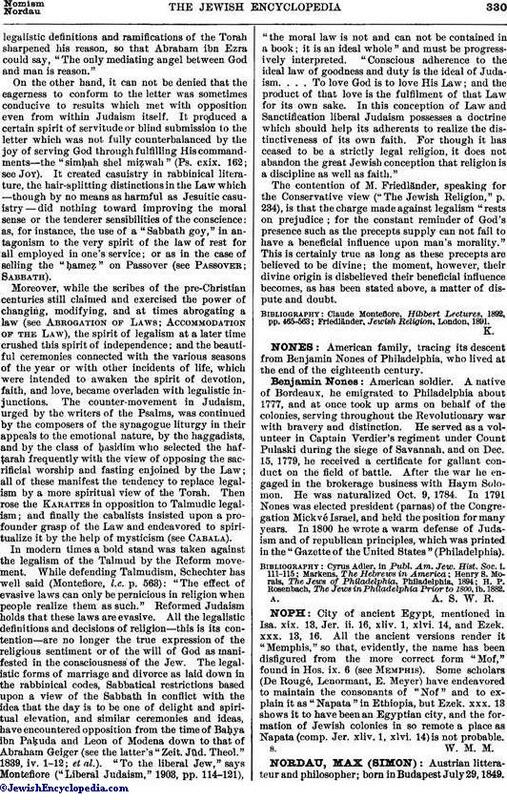 The Austrian official decree condemned the work for the crimes "of insulting members of the imperial family; of disturbing the public peace by attempting to arouse contempt or hatred for the person of the emperor; of denouncing religion; and of inciting to hostility against religious communities." Nordan's next contribution to this remarkable series of studies in the mental and moral pathology of modern civilization was his "Paradoxe," Leipsic, 1885 (8th ed., 1903; Eng. transl. by Louis Schick, Chicago, 1895, and by J. R. McIlraith, London, 1896). Of his other publications the following may be mentioned: "Die Krankheit des Jahrhunderts," a novel, Leipsic, 1887 (6th ed., 1902; Eng. transl., New York. 1895, under the title "The Ailment ofthe Century," and London, 1896, under that of "The Malady of the Century"); "Gefühlskomödie," a novel, Breslau, 1891 (Eng. version, New York, 1895, and London, 1896); "Seelenanalysen," Berlin, 1892 (Eng. version, New York, 1896, under the title "How Women Love, and Other Tales"); his four-act drama, "Das Recht zu Lieben" (Eng. version, "The Right to Love," New York, 1894; French version by Albert Bloch in "La Revue d'Art Dramatique," new series, iv.-v.; English transl., New York and Chicago, 1895), produced at the Lessing Theater, Berlin, and on a great many stages in Russia, Italy, etc., 1892. His "Entartung" (2 vols., 1893; Eng. transl. under the title "Degeneration") soon provoked a very vehement literary controversy. In this work Nordau strives to demonstrate that many authors and artists manifest the same mental characteristics as insane criminals; and that they exhibit traces of "degeneration," which he defines as "a morbid deviation from an original type, and satisfy their unhealthy impulses with pen and pencil." His drama "Die Kugel" was presented at the Lessing Theater, Berlin, on Oct. 31, 1894; and in 1897 his novel "Drohnenschlacht" was published in that city. In the following year appeared another play from Nordau's pen, "Doktor Kohn" (3d ed., 1900). This tragedy has for its motive the intermarriage problem. The hero, a young Jewish scholar of high standing in the learned world, is in love with and is beloved by a beautiful, wealthy, and cultured young Christian woman. Nothing can be urged against the marriage except their religious differences. The question presented to Dr. Kohn is whether it is right for him to accept Christianity without faith in its teachings. As aids to the solution of the problem he is brought in contact with three typical anti-Semites: an Orthodox ecclesiastic, a corps student, and a pompous military officer. When Herzl started the Zionistic movement Nordau was one of those who most quickly and ardently responded; and these two at once came to be looked upon as the natural leaders of the movement. Consequently, when the congress was held at Basel in 1897 Herzl was elected president and Nordau first vice-president without question. After the completion of organization Nordau delivered an address on "Die Allgemeine Lage der Juden" ("Officielles Protocoll," pp. 9-20), which thrilled the world. Three of Nordau's speeches are particularly noteworthy: one delivered in Berlin April 26, 1898, on "Die Gegner des Zionismus"; one in Vienna on "Strömungen im Judenthum"; and one in Paris on "Der Zionismus und die Christen." All of them were published in the Zionistic organ "Die Welt" (Vienna).